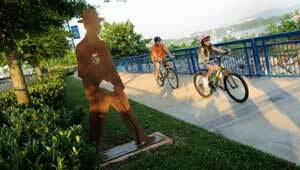 The backbone of Chattanooga's greenway and trail system-and one of the most beloved outdoor spaces in Chattanooga, the Riverwalk runs through the heart of downtown and along a revitalized riverfront, offering scenic waterfront views to walkers and cyclists. The trail crosses the Walnut Street Bridge, one of the world's longest pedestrian bridges, and ends at a fishing park below Chickamauga Dam. Since 1994, TPL has been working with the City of Chattanooga and Hamilton County to facilitate land acquisition, planning, and funding for the regional greenway system.